It is said that with one glimpse, Rubies catch the wandering eye and instill feelings of love while giving its wearer vitality and health. Ruby is an iconic gemstone known for its fiery color. Our rubies are both strong and graceful while offering the highest qualities of the splendor only a ruby can offer. 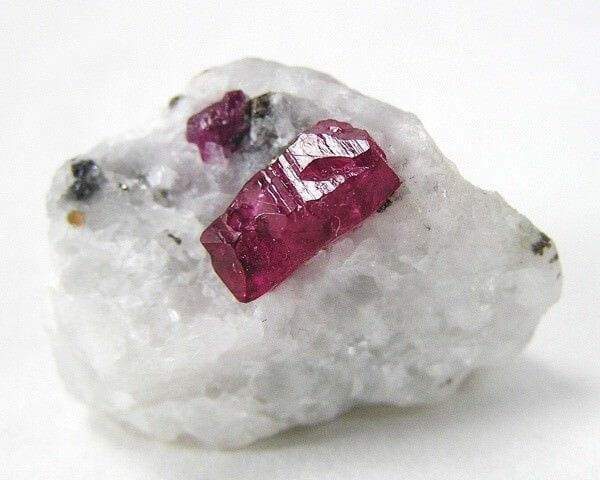 A pink to blood-red colored variety of the mineral corundum, ruby is the most valued gemstone of its mineral species, even more so than sapphire. It is well-loved for many reasons, including its intense red glow when viewed in the sunlight, its red fluorescent light emitted in the first laser in 1960, and its high ranking on the Mohs scale of mineral hardness. As one of the most historically significant colored gemstones known to mankind, ruby has always symbolized passion, life and power among many different cultures. In 100 A.D., a Roman scholar named Pliny wrote about the stone in his Natural History, with detailed descriptions about its hardness and density. Ancient Hindus divided rubies into four separate classes, naming the true Oriental ruby “Brahmin.” They held the belief that anyone who possessed Brahmin was to have resolute protection, and that anyone who offered this stone to the god Krishna would be reincarnated as an emperor or other person of similar status. Throughout history, ruby has collected a myriad of legends and beliefs. People in India understood rubies to provide peace between their owners and their enemies. In Burma (a major source of the gemstone dating back to at least 600 A.D. – now referred to as Myanmar), warriors carried rubies to make them indomitable in battle. However, in order for the stones to work effectively, they had to be inserted into their flesh. Ruby has also been called the most precious of the 12 stones created by God. With the birth of the western world, ruby became one of the most desirable gems of European royalty and the upper classes. Medieval Europeans often sported rubies to bring about good health, wisdom, financial status and success in love. The word “ruby” originates from “ruber,” the Latin term for “red.” The glowing red of ruby suggested an inextinguishable flame burning in the stone, even shining through clothing and able to boil water. Ruby’s intense red color is caused by the presence of chromium, which is considered by gemologists as the “rock star” of trace elements. Its formula is Al2O3:Cr and has a 9.0 rating on the Mohs scale of mineral hardness. Its crystal system is trigonal (hexagonal scalenohedral), with a crystal habit that has terminated tabular hexagonal prisms. Natural rubies all have regular deficiencies, including color impurities and rutile needle inclusions referred to as "silk." These inclusions are crucial for gemologists in differentiating them from synthetic, simulant or substitute stones. Typically, the rough stone is heat-treated prior to being cut. And though most rubies today are treated in some fashion­ – heat treatment being the most common practice – rubies that are left entirely untreated (but still of first-rate quality) are sold at a much higher premium. In some rubies, a three-point or six-point asterism – or "star" – may be present. These stones may be cut into cabochons in order to show the effect most efficiently. Both types of asterisms are most noticeable when viewed with a single-light source, when the light is reflected off the silk in a specific way. This is one instance of how inclusions directly increase a gemstone’s value. Rubies also have the ability to show color changes – though this occurs very rarely –as well as chatoyancy, better known as the "cat's eye" effect. For hundreds of years, the Mogok Valley in Upper Myanmar (originally known as Burma) has been known as the world’s main source for ruby. More recently, with the discovery of better-quality stones in central Myanmar, the area of Mong Hsu became the leading mining area for rubies.